FILE - In this photo taken July 17, 2014, Uighur residents gather at a road side stall in the city of Aksu in western China's Xinjiang province. While officially trumpeted as a way to promote ethnic harmony, the move is widely seen by observers as stepped-up surveillance of the Muslim minority that may instead fuel, rather than ease, inter-racial tensions. Beginning December 11, thousands of cadres from the northwestern province traveled to the countryside and lodged with Uighur families for a week-long stay of “eating, drinking and forming a family bond” with members of the ethnic group, state media reported. 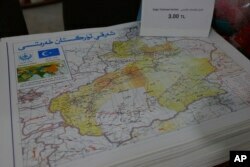 A map showing "East Turkistan," the name Uighurs who oppose Chinese rule call their homeland, a region China refers to as Xinjiang is seen at a bookstore in Istanbul's Zeytinburnu neighborhood, Dec. 14, 2017. While a percentage of the cadres may be ethnic Uighurs or distant relatives to Uighurs, many of them are still Han people from local governmental departments, public schools or the judiciary apparatus, observers say. Most are therefore total strangers, with different cultural and religious customs, as well as a hidden political agenda to rural Uighur families, Dilxat Raxit, spokesman for the Germany-headquartered World Uighur Congress, an organization of exiled Uighurs, told VOA. “Their main goal is to investigate the inclination of Uighurs towards religion during their stay in Uighurs’ homes. 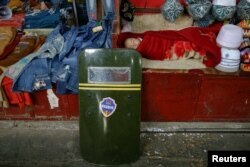 They will check if these Uighur families keep the Quran, or any other relevant items or books at home,” Raxit said. He added that Uighurs have no choice but to take these cadres in, who also serve as the authorities’ mouthpiece to hold home-based propaganda sessions and preach about the so-called spirits of China’s 19th National Congress after the twice-per-decade meeting was wrapped up in late October. According to Raxit, the program is the first of its kind under the leadership of the Xinjing Uyghur Autonomous Region's party secretary, Chen Quanguo – a solider-turned politician. Until last August, Chen was party secretary of the Tibet Autonomous Region for five years. Adrian Zenz, a Germany-based researcher, called "relative's week" an intensified intrusive measure but said it's nothing new, as similar security and social controls were in place under Chen’s predecessor, Zhang Chunxian. “This includes, obviously, surveillance. They’re looking to gather information, obviously, look for signs of trouble, of what’s defined as extremism, etc.” Zenz told VOA. Prior to this, tens of thousands of cadres in Xinjiang were sent to live in the villages, people who Zenz said help the local government have a better grasp of any potential racial unrest among the ethnic group. 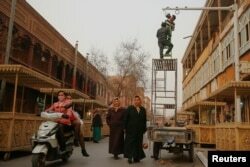 The researcher added that the security in Xinjiang under Chen’s high-pressure rule is getting tighter than ever. His research showed that Chen dramatically increased the police presence there in the past year by having advertised more than 90,000 security-related positions – nearly twelve times the number advertised in 2009 following the Urumqi riots. The July 2009 riots in Urumqi began as a protest by Uighurs, but escalated into a series of violent attacks that officials said claimed 197 lives and injured 1,721 others. Raxit argued that such systematic repression of the province’s 10 million Uighurs - including pervasive discrimination, religious and cultural suppression - will eventually exacerbate ethnic tensions. “This type of political maneuvering will never serve the purpose of weiwen (stability maintenance). Instead, it will further instigate unrest and escalate inter-personal tensions [between Hans and Uighurs],” Raxit added. 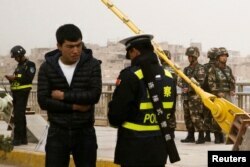 Uighur militants carried out several deadly attacks inside China and abroad in recent years. A 2014 knife attack at a train station in Yunnan province killed more than 30 people. The 2015 bombing of a shrine in central Bangkok that was popular with Chinese tourists was alleged to be retaliation for Thailand's deportation of 109 Uighur male refugees back to China. Zenz said that Chen’s stepped-up securitization and policing strategies may have enjoyed a short-term success, but will prove unsustainable in the long run as they bear both economic and inter-racial risks, as well as the alienation of the local Han population. “The maintenance of very high pressure and stress over a long period of time is creating a strong liability, a strong risk in a long term. The pressure of the securitization is felt by everybody. It’s also impacting the Han. And the Han in Xinjiang is very important to the local government. So, alienating them is a major risk,” the researcher said. The departure of Han people in Xinjiang has led to the sharp decline in the region’s residential property investment last year, which fell by 15 and 22 percent in Han-dominated cities of Urumqi and Karamay, Zenz’s study showed. Online comments toward the new “relatives’ week” program, however, are mostly favorable although some of them sound slightly sarcastic. FILE - A Uighur man looks at a passing Han woman outside of his restaurant in Shanghai, April 23, 2014. But a user complained that his petition to the local government hasn’t been handled for more than a week. “Has the staff all travelled down to the countryside?” he asked.